Create a little culinary magic! 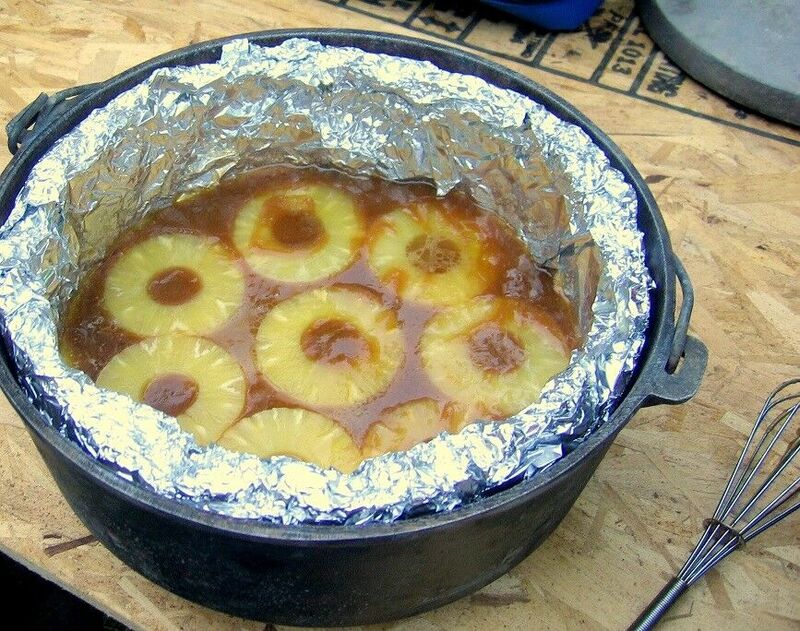 Bake up this nearly fool-proof Dutch Oven Pineapple Upside-down Cake on your next camping trip – or in your own backyard. 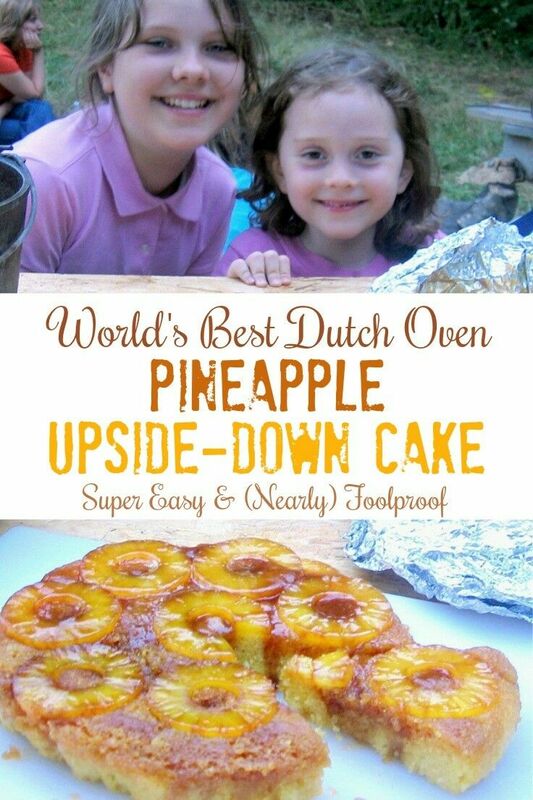 By conservative estimates, I believe I have taught over 1,000 adolescent and teenage girls (and more than a few grown women and men) how to make Dutch oven pineapple upside-down cake. 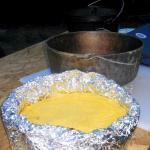 Nearly fool-proof and dependably crowd-pleasing, it is a camping staple in my family. 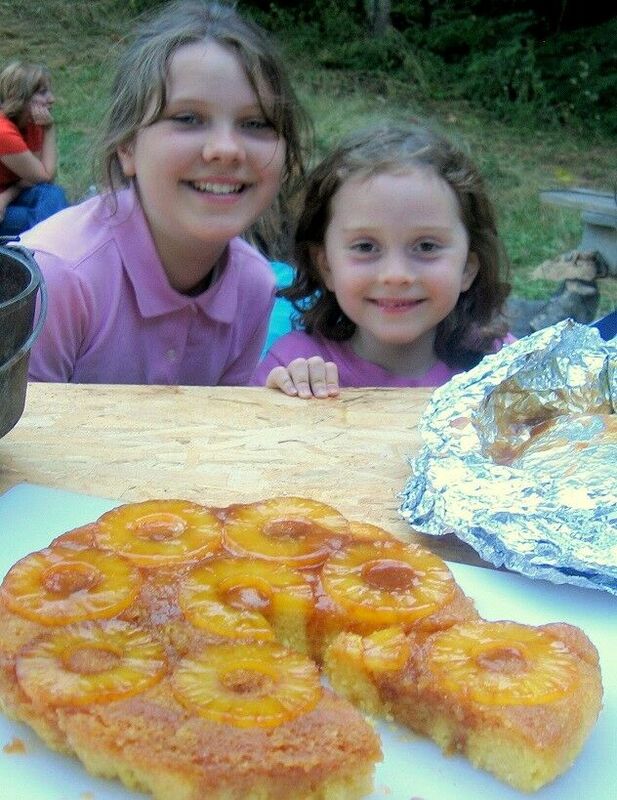 So much so that my kids, their friends, my Girl Scouts, and a long string of Counselors-in-Training have all come to expect it as a God-given right – if I take them anywhere near a campfire, they will get pineapple upside-down cake. “When the lid is on that big round thing, it is NOT a pot! Make that your mantra. With a little practice, you can learn to regulate the temperature of your Dutch oven very closely and then you will be able to cook almost anything in it that you can make in your oven at home. Always think of a Dutch oven as an “oven” instead of just a “pot”! 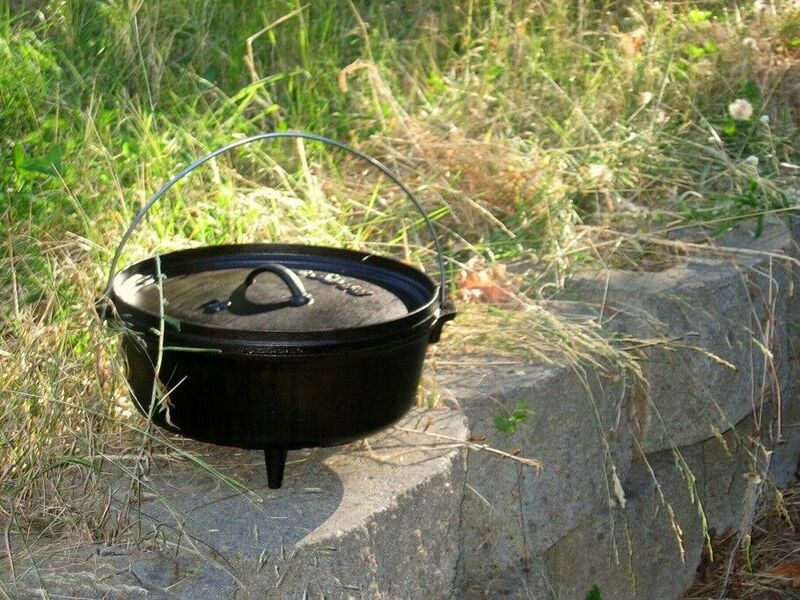 For outdoor cooking, you need a Dutch oven meant for camping – one with legs. Size: At one time, I cooked for a family of seven, and a 12-inch oven was essential. Now, with only three to five of us on any given camping adventure, a 10-inch is more than enough. If you have a big family and healthy appetites, you may want to check into a 14-inch oven. Anyway way you go though, be sure and buy a quality product, because in the case of Dutch ovens, you definitely get what you pay for. Also, at the risk of suffering the wrath of all that is holy in the camping world, I have to admit that my favorite Dutch oven for baking is… (shhhh)… aluminum. Yep. There, I said it. I feel better now… I think. I’ve cooked in a lot of Dutch ovens, and while you can’t beat cast iron for giving you a perfect brown and sizzle, when it comes to delicate baking, I much prefer aluminum. I can regulate the temperature more accurately (this is, admittedly, a personal thing) and I feel like the baking process is “cleaner.” As a bonus, it only weighs about a third of that of a similarly sized cast iron version. These nifty gadgets came out when I was a kid, and I remember when we got ours my Dad thought it was absolutely the “cat’s meow.” Not only does it allow you to carry your (often very heavy) Dutch oven safely, but it holds the lid so steady that you can lift it to take a peak without getting ashes or disturbing your coal/briquette distribution. I won’t cook with a Dutch oven without one. Butter, brown sugar, and pineapple rings. First, double line your Dutch oven with aluminum foil. I use the extra-sturdy, extra-wide variety. 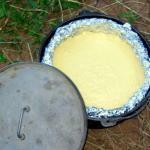 Melt the stick of butter in the bottom of the Dutch oven, either by sitting it over coals or on top of a camp stove. When the butter is completely melted, throw in the brown sugar and stir until it is beginning to melt. It should be thick, but not clumpy. 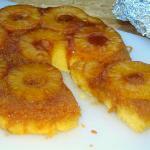 Set the pineapple rings in the bottom of the Dutch oven on top of the brown sugar mixture, reserving pineapple juice. If you are using a 10-inch Dutch oven, you will have one extra ring of pineapple. Give this to your favorite child. Make cake following the directions on the box, using the reserve pineapple juice and adding just enough water to achieve the required amount of liquid. I always just use the pineapple can to measure the liquid – it makes one less dish to wash. Carefully pour the cake batter over the pineapple and brown sugar mix. Put the lid on the Dutch oven. On calm, moderately warm day with no wind, you will need about 12-14 briquettes on top and 9-10 on the bottom for a 10-inch Dutch oven. And yes, I mean briquettes. I have cooked many times with coals from my fire, but briquettes allow you to very specifically set the temperature inside your oven, thus insuring perfect results. Bake the cake for about 30 minutes. Don’t lift the lid to check it for at least the first 20 minutes or you will just let all the heat out. I usually check it the first time when I can smell the cake baking. The cake is done when it is bouncy to the touch. 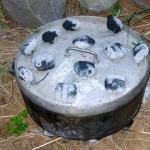 When the cake is done, remove it from the coals and remove the lid. Then you need another big flat thing to put on top. For this, I usually cover my camp cutting mat with foil, because this is ultimately what you cake will be served from. Now, gather all the kiddos around, because this is usually pretty impressive. Peel back the edges of the foil from the cake sides but leave the bottom alone. Set the second big flat thing gently on top of the cake. Put one hand underneath and one hand on top. Say “1-2-3” and flip the cake in one smooth, fluid motion. Flourish is optional. Carefully peel away the foil from the now top, and stand back to accept appreciative “oohs” and “aawws." if you weren’t camping, what temp would this be baked at and for how long? I dislike anything to do with camping…. Probably at about 350 for 30-40 minutes. Oh that looks amazing! Stopping by from SITSSummer and now I’m following! can i use a cast iron skillet instead of a dutch oven? I don’t think a skillet will allow for enough headroom above the cake for it to rise properly, and I know it isn’t designed to circulate heat the way a dutch oven is; however, if you give it a try, please stop back in and let me know how it turns out. I have used a cast iron skillet (tall one) to bake this cake for years and it works well in the oven at home. I am sure it can be used as is and baked in a skillet-no foil needed. Yes, you can do it in a cast iron skillet – I’ve done it many times on the grill, with the lid closed. It’s a very forgiving recipe. Thanks for your recipe and helpful tips! I remember doing this at an adult training weekend for Girl Scout leaders. Now I will try it with my Junior troop at our camping trip this weekend. Wish me luck! Good Luck! I just made one on a camping trip last weekend – in the rain and wind and cold. Still turned out fantastic. Yours will too!! Thanks, that is great to know! Looks delicious, I must admit that I’m tempted to try it. Just one more reason to love my dutch oven. Is there anything they can’t do? Dutch ovens can do practically anything! The trick is that when the lid is on, you need to always think of it as an Oven and not as a Pot. You can bake bread, pies, casseroles – anything. You can slow-cook, braise, boil – you name it!! Just found your page and am excited to try this recipe with my girls camp next week. Instead of foil it should be fine to use Dutch oven liners, shouldn’t it? I have some of those and hear they are great. Dutch oven liners should work fine. Let me know how that turns out – I’ve never tried it with a gluten-free mix. 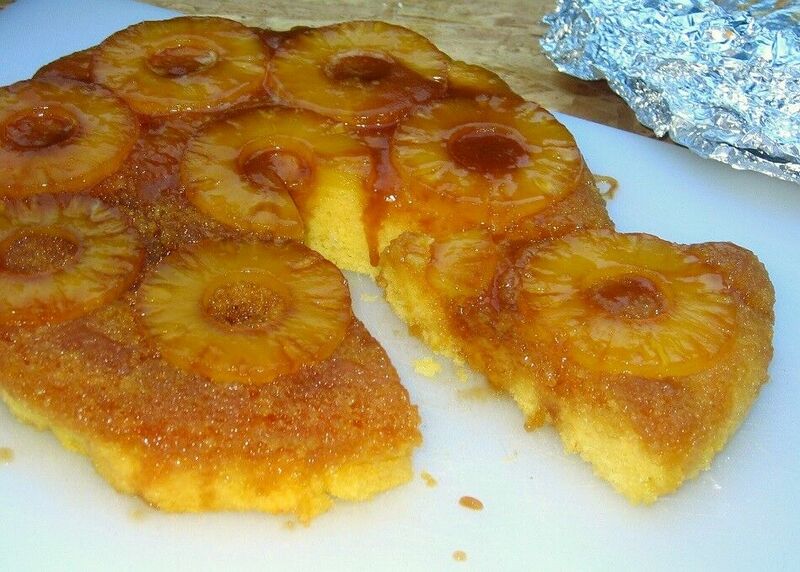 I love pineapple upside down cake; I always thought it makes a great presentation without the need for frosting or decoration or anything else. I recently saw, but forgot where, a recipe for a large skillet upside down cake with chopped pecans, that I wish I could find and try. (not sure if it was oven or stove top prepared, but whatever the case, the end result appeared a dark golden caramelized and sugar crust on the upside with, interlaced with chopped pecans, that had been ried on medium heat, in butter and rum; to drizzle over the cake, after turning over. 1. when do I turn the cake over: while it’s still hot, warm,. or room temp? 2. Are the pineapple rings baked in the brown sugar to lightly brown, before the cake batter is poured onto the pineapple and/or cherry. I’ve made the cake a few times,, (not Emeril’s}, with hit or miss results, like the pineapple sticking to the bottom of the pan. Also ,3. which is preferable: cast iron,, stainless steel, or glass? 4. Is the pan supposed to be greased and floured, or is that a ba-a-ad thing? Browning Pineapple Rings: Instruction  Set the pineapple rings in the bottom of the Dutch oven on top of the brown sugar mixture, reserving pineapple juice. If you are using a 10-inch Dutch oven, you will have one extra ring of pineapple. Give this to your favorite child. Greasing the Pan: Instruction  The pan is greased when you melt the butter in the pan/liner. You can grease it more if you want, but I never do, and I’ve never had a problem in over 100 cakes. The foil liner looks “bulky” as if it’s wrapped around a pan (or something). Is that true? No. The foil is rolled at the top to allow the lid to sit flush. The liner is pressed directly into the Dutch oven. There is no other pan. I just bought a dutch oven and got it in the mail last week. I need to try this recipe with it. Thanks for the idea. Last week, I cooked the cake over a campfire – and it was quite spectacular and delicious. Your instructions are spot-on. I would love to try it this weekend while we are camping. Do you think it would be ok to do on an open fire???? I would think as long as it wasn’t high flames it would be but really am not sure. I’ve honestly never heard of Dutch over maybe because I am not a camping person, but this looks like something that could come in handy. The pineapple cake looks delicious! This looks like such a fun summer activity! Crazy how many people you’ve taught how to do this over the years! We have a bonfire pit in our backyard and I think I’m going to have to try making this ASAP! YUM! You definitely should! You are going to love it!! Thanks, Lesley! I’m always happy to help when I can – I use Shareaholic for everything. The “Sharing is Caring” at the bottom of the post is set up under “Settings→Share Buttons→Post/Below Content→Customize.” Hope that helps! . I love using my dutch oven! I will be posting an easy dutch oven peach cobbler recipe tomorrow. I shared and pinned your recipe! 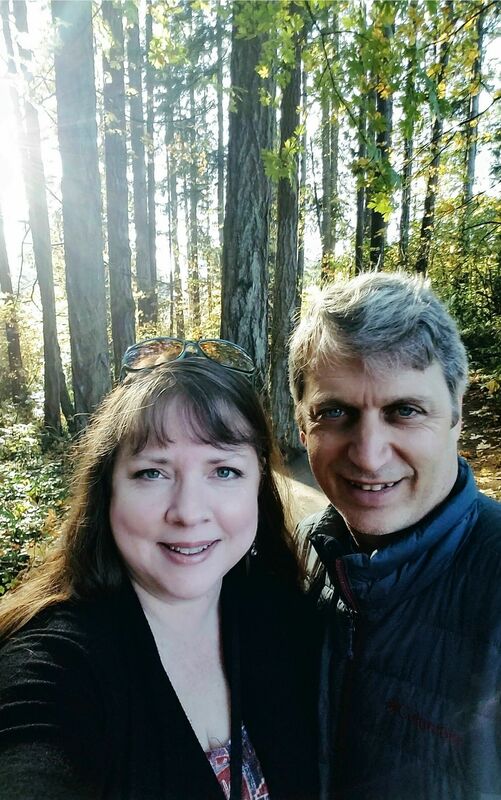 Thanks for sharing, Carmen! I will be sure to return the favor. ? This cake recipe looks wonderful, thank you for sharing! I can’t wait to try it! Thank you for stopping by, Ashleigh! Never heard of this before, but it looks so good! This recipe just helped me win a Dutch oven dessert competition! Amazing recipe!! !